I have been so excited to plan Blaire’s first event, her Baptism into the Roman Catholic church. We’ve met with the priest at our church, set a date and picked out a white dress for her to wear on the big day. It’s going to be a small and intimate gathering so I wasn’t necessarily planning on sending out invitations just to keep things simple. 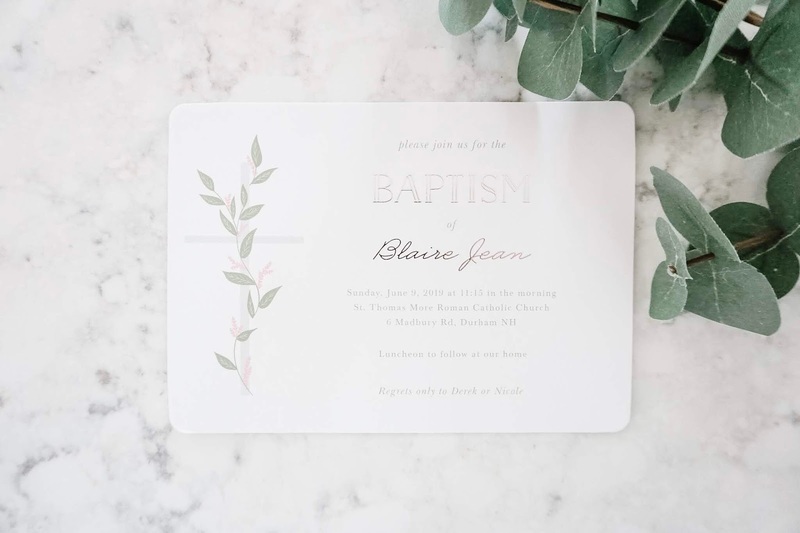 However, when I worked with Basic Invite earlier in the year I noticed they had a beautiful selection of Baptism invitations which seems so hard to find these days. This peaked my interest so I browsed through their options and discovered they also have First Communion and Confirmation invites as well! I’ll keep that in mind for the future. Since Basic Invite offers a service where they will address, stamp and mail out your invites for you, I saw it as less of a daunting and time consuming task and decided to order some! I only had to do the fun part, selecting and customizing! I’m so glad we’ll not only get to have these mailed to our family but also to have it as a keepsake from this important day in Blaire’s life. Customizing the invitation was a blast. I was able to change the colors and even some of the wording to exactly how I wanted it to be. Basic Invite is one of the few websites that allows customers almost unlimited color options with instant previews online. Once you select a design you can change the color of each element on the card to over 180 different color options so you can make sure the card is exactly how you want it down to the most minute detail. This is what sets them apart from almost any other online stationery company. Custom Samples - Basic Invite is one of the few websites that allows customers the ability to order a printed sample of their actual invitation so they can see exactly how it will print as well as the paper quality before they ever have to place their final order. This is a rare feature that is so important! There’s nothing worse than getting your finished product and noticing a mistake or something that’s a bit off. Over 40 Different Colors of Envelopes - Basic Invite is just as colorful with their envelopes as they are with their invitations. You can choose from over 40 different colors when it comes to envelopes so that you can make your invitation stand out even before it is opened. All of the envelopes are peel and seal so the envelopes can be quickly and securely closed — time saver! Address Capturing Service - Basic Invite offers an address capturing service that allows you to simply share a link on Facebook, Twitter, Instagram, or any other form of social media to request your friends and family’s addresses which are then stored in your Basic Invite account and can then be selected during the design process. Basic Invite offers recipient address printing at no cost on all Christmas card orders. This is so helpful and takes care of a lot of the daunting details that come along with sending out large batches of cards, especially during the busiest time of the year! Foil - Foil cards are available in gold, silver, and rose gold. Choose from flat or raised foil on all of Basic Invite’s foil designs. This design element will add a lot of interest and is such an eye catching quality for festive designs or fancier pieces. I added this to our invitations and it looks stunning! I’m so glad I not only have had the chance to work with Basic Invite, but also to experience their products and services first hand. Everything is so beautiful, easy, personal and custom — a combination of features I haven’t been able to find anywhere else. I’m already starting to browse for first birthday invites! Though, that’s a bit of a ways away. However, I will definitely need Baptism thank you cards which is another unique and specific product that I have hardly seen offered elsewhere. I love that you can carry through the design from the invite to the thank you note as well. It’s details like that that make my designer heart sing!